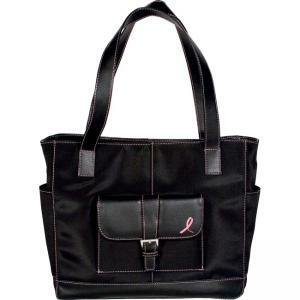 Complete your Pink Ribbon collection with a matching tote. Black microfiber tote features a pink contrast stitching and interior to support breast cancer awareness. Day-Timer will donate a portion of the proceeds from this special tote to the Breast Cancer Research Foundation. Interior is roomy and open. Use front pocket with a magnetic closure for keys or cell phone. Front pocket has a debossed pink ribbon emblem. Use side pockets for water bottles or an umbrella. Tote also includes removable key fob and double handles with an 8-3/4" drop.